So I went to Games Day this year in Baltimore... and I had a good time. I figured it might be a while before going again (next year being in Chicago apparently) so I decided to save my money this year and go. While I saw all the same cool stuff as everyone else, I don't have any secret tidbits to offer here that can't be found in any of the numerous forums already running crazy with rumors. That being said, I did take some pictures throughout the day. I didn't play any games, but managed to talk to a whole bunch of cool people and try my hand at Golden Demon for the first time. I started the day with entering my Dark Eldar Archon conversion into Golden Daemon. Yep, I knew I wasn't in Demon contention, but I was curious to see just how far my model would make it. Turns out, he went pretty far, made it past the first cut and collected a number of votes after that as well. I talked with a judge when I picked him up and they told me the very things I knew were going to cause problems. Next year will be different. I'll have more about this in another post next week. I ran into Dave Taylor and managed to sneak a peak at the complete Storm Wardens army before it went downstairs to the winner. It's amazing to see all the models in real life. Despite all the different painting styles, the army looks great all together. I also met Matthew Boles of View From the Table's Edge. He donated some of the pieces to the Storm Wardens army to help us fill out the list. At this point, it was still too early to head into the convention, so I hung out and planned my day. Despite my Wife giving me a handful of money, I'd already blown through most of it with just breakfast and parking fees. As soon as the doors opened, I went downstairs to find Fritz and Jawaballs at their club table. I wanted to do this first before they got into playing games all day. 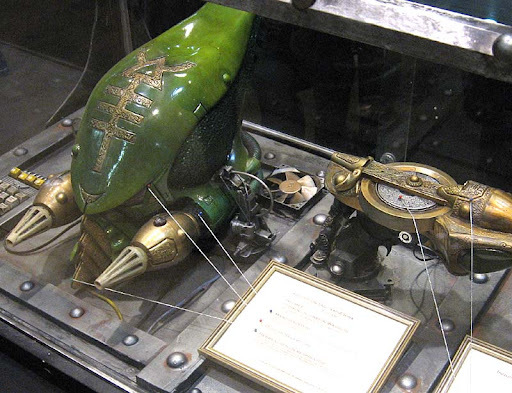 Right inside the door was a display case with a life-size Eldar Striking Scorpion helmet and gun. Very cool to see these things like this. Kinda makes it believable to see "real" pieces of equipment like this. I made my way over to the club tables and Fritz and Jawaballs were already set up and ready to go. 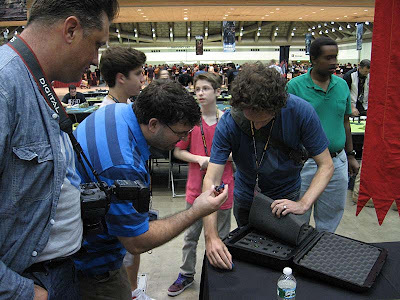 It just so happens that John from Santa Cruz Warhammer was there and I managed to make it just in time to watch the winner open up and go through the whole Storm Wardens army. Very cool. I also stopped by the Fantasy Flight tables to find Ross Watson and thank him for his help and support with the Storm Wardens project. After that, it was time to make the lap and see what kind of cool stuff I could find. 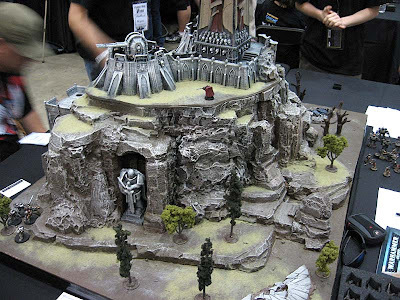 There was a great Kill Teams table done by Good vs Evil Games and Comics. 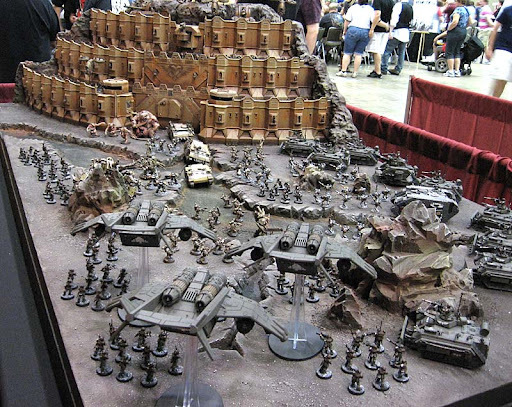 I found another board with a Submarine that had come through the ice cap that was done by Ineptus Astartes. Then I made my way over to the display boards. Sometimes I wonder about Games Workshop when they show Dark Angels stuff. 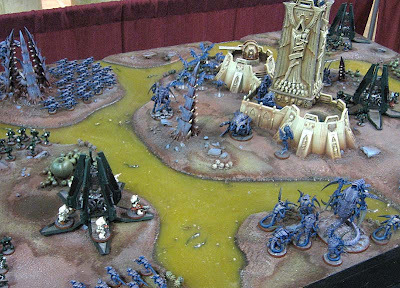 Great looking board, very cool and all to see the squads drop podding into a Tyranid invasion to reclaim one of their fortresses. Trouble is, "technically" speaking, Deathwing terminators can't take drop pods. But there they are, a whole squad disembarking from their very own drop pod to fight the Tyranids. It hurts sometimes. There was another table with Imperial Guard/Inquisition forces attacking a Chaos held castle. I saw this one being built on the GW site, so it was cool to see it finished in real life. The biggest game/table of Space Hulk I believe I've ever seen. Then I ran into John from 40k Hobby Blog and gave him the grand tour of the place showing him all the cool stuff I found. 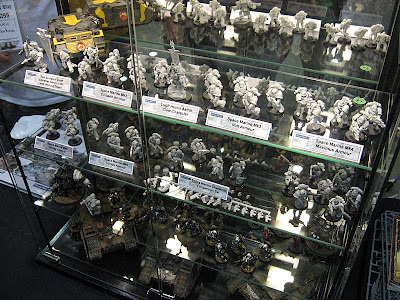 Forge World had all their goodies on display too. Lots of the older MK armour that has been recently released along with some new stuff they talked about in their afternoon seminar. Imperial Armour 9, 10 and 11 are coming and they are looking to update IA:1 in the future too so it's more in line with the current rules and such. Of course the line to the FW store was incredibly long all day. Big money was spent there. I didn't get anything though. I bumped into Hudson too, he was cruising around the Golden Demon lounge and we chatted with some other guys about blogging and how some people make things look so easy. I managed to run into Mike from Warhammer 40k by Micho towards the end of the day and we talked a bit about Golden Demon painting. Early on, I met fellow Bloggers The Painting Corps and Aker's Minis. Congrats to Aker's Minis for winning a Demon on his squad entry. I also managed to chat for a few minutes with John from The Adept's Forge and John from Santa Cruz Warhammer about mentoring in the hobby towards the end of the day. All in all, a good time. I'm glad I went and I'm looking forward to next year. I just need to convince the Wife I "need" to go. 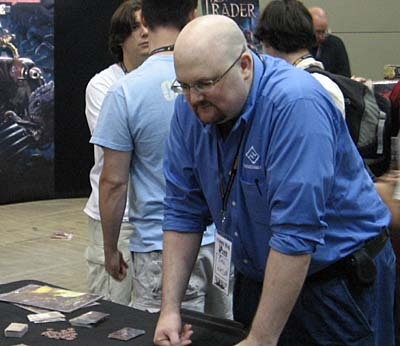 If you went to Games Day and you've got the obligatory summary post up on your blog, email me or leave a comment with your post link and let me know, I'll add a link to it here. I have mine up, with silly photos also. perhaps we should have a FTW club table with a mentoring workshop. Glad you had a great time! 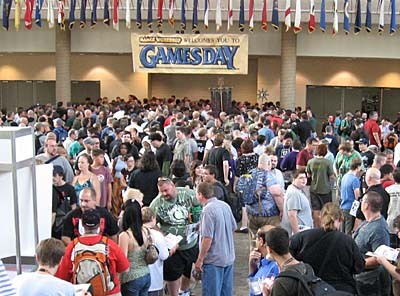 The UK Games Day is in just under five weeks... I CAN'T WAIT! I'm wondering whether the displays etc. will be the same, or whether it varies from country to country. Darren: Let us know for sure, hopefully you guys get some different stuff to drool over. Hmmm... A FTW club table sounds like fun. We have pics from our event and a few random shots up now on www.paulsbasementleague.blogspot.com and about 500 more pics and 3 gigs of video to sort through this week. Its too bad I didn't get to talk to you guys until the very end of the day. I was hoping to absorb some green stuff skills using the mind meld technique but it looks like its back to good old practice instead. I've got some photos up too, Ron, including some Golden Demon winners. I'm still sifting the clear pics from the fuzzy ones, so may add another set later. It was nice meeting you and discussing our GD entry pieces. Your Archon was REALLY well painted and we should definately plan on doing those group critiques for next year! Had a great time in Baltimore, MD @ Games Day 2010. Especially the Space Hulk and the large Warhammer Fantasy Battle the Skaven vs. Lizardmen. 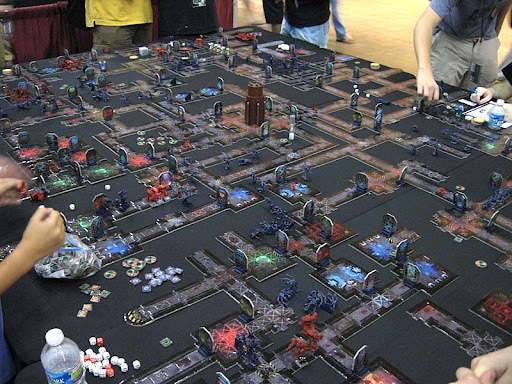 Leo: After seeing the Space Hulk table, I wondered how the Marines were going to win with all that real estate they had to cover.